Chicago Loop: Daley Plaza / Untitled – by Pablo Picasso – Ten Fun Facts. Made of Corrosive Tensile [“Cor-Ten”] steel / 50 feet tall / 162 tons weight. Untitled – by Pablo Picasso.
. Picasso never came to the US. He died in April 1973, and never saw the completion of his design.
. Picasso made a 42-inch maquette of the piece. He refused to accept the payment of $100,000 for his work and wanted it to be a “Gift to the People of Chicago.”. The maquette was gifted to the Art Institute of Chicago and is on display.
. The $300,000 required to fabricate the sculpture was raised by three charitable foundations.
. The actual fabrication of the sculpture was done in Gary, Indiana. The piece was completely assembled here, and then disassembled for shipment, and then reassembled in the Daley Plaza.
. During the unveiling on August 15, 1967, a.message from President Lyndon B. Johnson was read..
. Initially the sculpture was greeted with lots of controversies: head of a woman, or Afghan dog , or even a Viking ship. While opinions differ, it was acknowledged as a monumental achievement in Cubism.
. It is important to note that “Chicago’s Picasso” is NOT the first monumental abstract sculpture in Chicago. Chicago already had Richard Lippord’s “Radient One”  in the lobby of Inland Steel Building . Another abstract installation was in 1964 at the University of Chicago by Russian Constructivist artist Antoine Pevsner named, “Construction in Space..” .. Then there was Cubi VII  by David Smith.
. But Picasso was the most famous and influential artist of his time, and his installation has widespread impact! 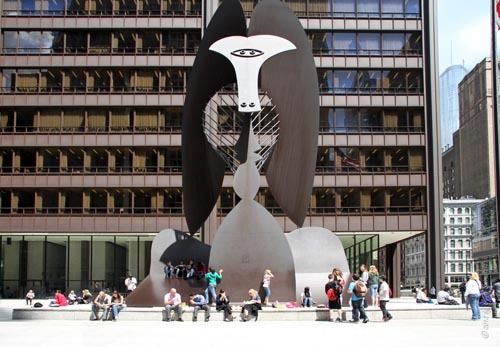 Within two decades of Picasso’s installation, Chicago saw a large number of monumental outdoor installations: it brought to Chicago many prominent sculptors of national and international fame, including Alexander Calder, Claes Oldenburg, Herbert Ferber, Ellsworth Kelly, Isamu Noguchi, Mark di Suvero and Louis Nevelson. There was a shift from commemorative to non-commemorative public art.
. It is important to note that the trend towards modern abstract sculptures was not isolated to Chicago. It was an international trend that emerged soon after the Second World War. In the words of distinguished art critic Franz Schulze.” Public Art is by now modern art, with virtually no exceptions, and the identity has been assumed wholeheartedly , in a stunning short span of post World War II time.” A trend contributing to modern abstract outdoor sculptures was the increased popularity of International Style architecture with glass curtain wall. 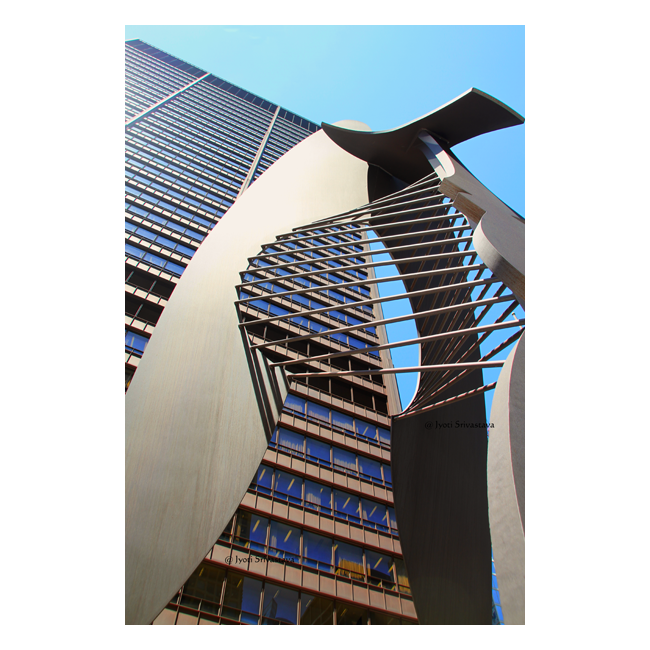 Now decorative elements were installed in outdoor settings and the style was usually modern sculptures which goes well with the modern architectural style.
. Picasso’s Chicago is said to be the grandfather of Public Art program in Chicago. It was installed in the Civic Center [later named Daley Center], which is the public square of Chicago. It is said to be catalyst to the city’s passing of Percent-for-Art Ordinance in 1978. It mandates that 1% [Since 1987, it is 1.33 %] of the construction or major renovation budget of a city-owned or city-financed building or structure or certain outdoor improvements is to used to acquire or install permanent artwork at that site. I can write on and on… but here are my posts..
[I] Untitled – by Pablo Picasso, click here..
[II] Aftermath of Picasso’s Monumental in Daley Plaza, click here..
[III] Making of Picasso’s Monumental Sculpture .. click here..